The beauty of this 3-piece cake stand is unmatchable. Made from the highest quality aluminum, it is sturdy and will stay in prim condition for years. Not alone for displaying a three-tiered cake, you can also use it to display cakes, cupcakes and ceramic fruits. 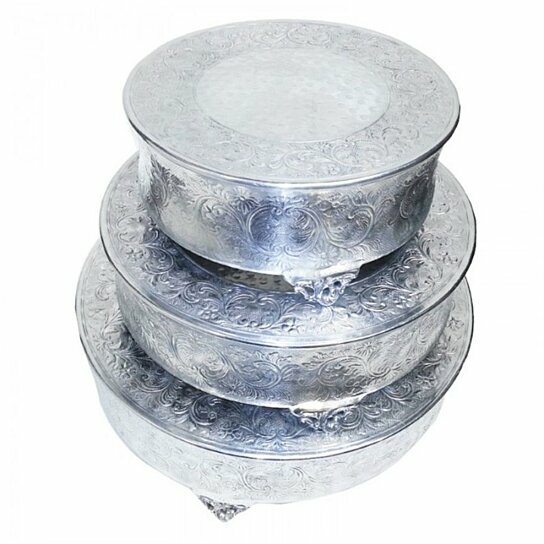 This 3-piece cake stand features silver finish with beautiful foliage detailing, these round stands are great to own. These stands can be kept on the dining table, kitchen counter.